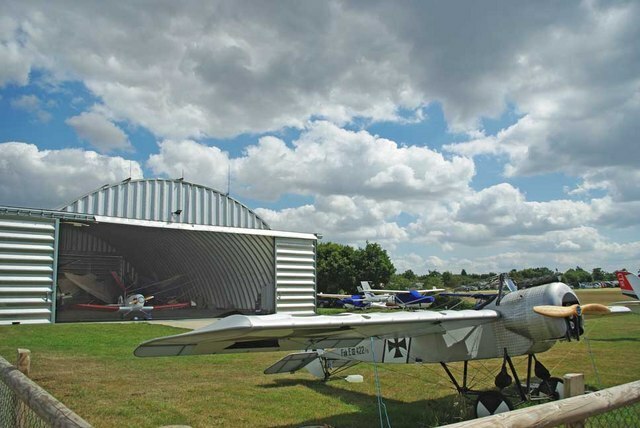 Once again, the contest that has now become the traditional start to the Carrier calendar enjoyed the hospitality of Damyn’s Hall Airfield in the Essex countryside. With the excellent facilities of the airfield’s clubhouse (loos, restaurant, picnic and viewing area), hot & cold running light aircraft throughout the day – a group of four Jodel homebuilts spent a great deal of time undertaking a variety of formation flying, apparently under examination for their air display licence – plus the activities of the local R/C model club as well as the Carrier and Scale flying, it was a good day out for anyone’s money! There was plenty of blue sky and quite enough sunshine to give most people pink faces by the end of the day, though the moderate breeze was surprisingly chilly and showed that Spring is not yet, er, fully sprung. 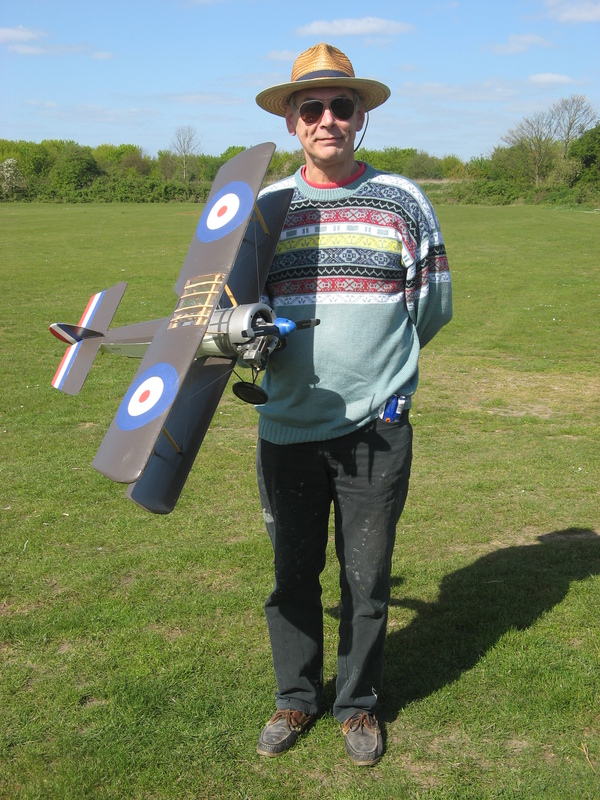 First to fly was Mike Welch, maiden-flighting his Sopwith Pup. 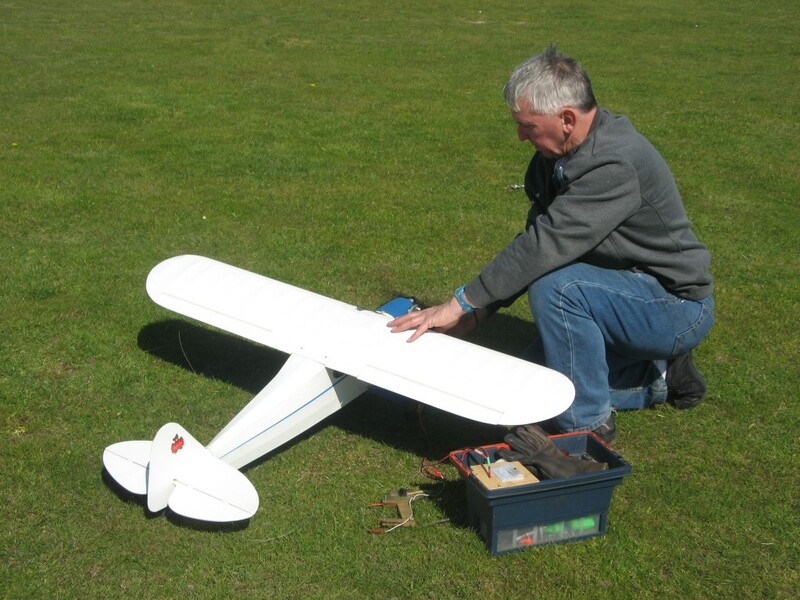 And, yes – a biplane! You may have noticed that this site has been promoting Carrier’s World War One Commemorative Event scheduled to take place at Old Warden’s Scale Weekend on July 19 & 20, and it’s even made the Aeromodeller magazine (thank you Andrew Boddington!). This event is essentially a subclass of BCD: the three highest scoring eligible models will receive special awards, irrespective of where they are placed in the normal BCD contest. Unhooked as well as hooked aircraft are permissible as there were more of the former than the latter in the early days of naval aviation, so the existing BCD landing score rule has been given an extra section to deal with unhooked landings (Ooo-er…). Click here for all the details! 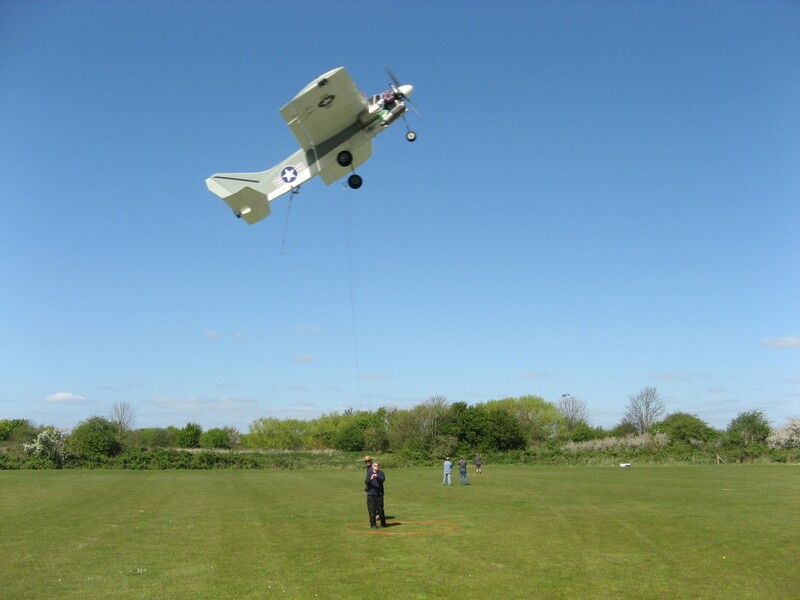 Mike Welch’s Pup is the first model for this commemorative event to be completed and he’s made it a replica of the Shuttleworth Collection’s Pup at Old Warden. 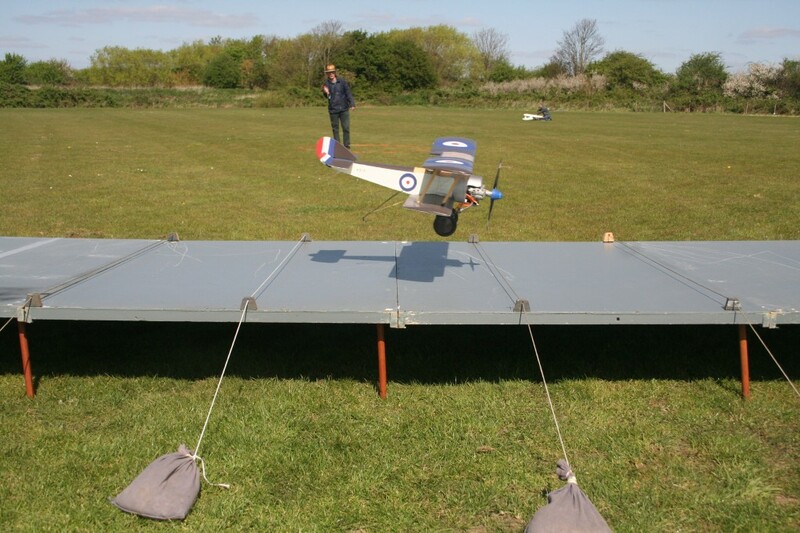 Although Pups were flown in both hooked and unhooked versions, Mike had chosen to hook his Pup and, true to his own Scale leanings, he had built it with a full scale fuselage (ie: not profile), had fully rigged it and had even fitted it with a four stroke engine for a more appropriate sound. Although it is not expected that this subclass will be able to match the performance of the top BCD monoplanes (even if profile fuselages, no rigging and 2-strokes are used! ), if we can get enough performance data from the Old Warden event, it should be possible to devise a Biplane Bonus Score which should level the playing field and hopefully encourage the construction of a few more of these old timers in Carrier’s future years. Mike’s Pup acquitted itself remarkably well despite the additional weight of the OS 40 4/s and the full fuselage (plus the extra drag of the big scale wheels and the rigging) and although it missed a hookup and ran off the deck, the model fortunately remained unbent – so Mike put it back in his car, saving it for further test flights at the first Old Warden Carrier event on May 3rd and 4th. 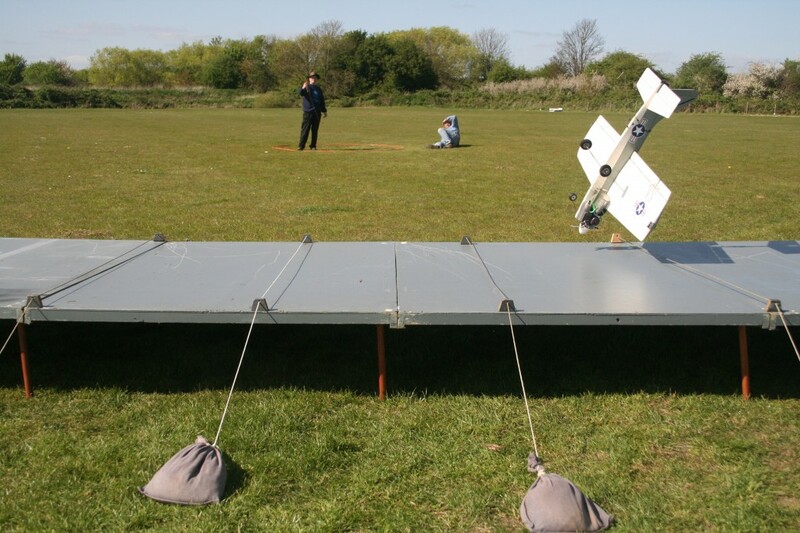 Later in the competition, Mike went on to use the other two BCD models he had bought along, and although he conclusively demonstrated that he could fly (and land!) the old ex-Noel Stephenson Douglas Skyraider better than either Andy Housden and Ray Ewart, to whom the model was loaned, his greater success was unsurprisingly with his lightweight and slow-flying Fairey Fulmar. Whilst the Fulmar is essentially a calm weather model, it nevertheless coped very well with the breeze and produced such a good slow run and landing that the score of 223.8 points got him second place! 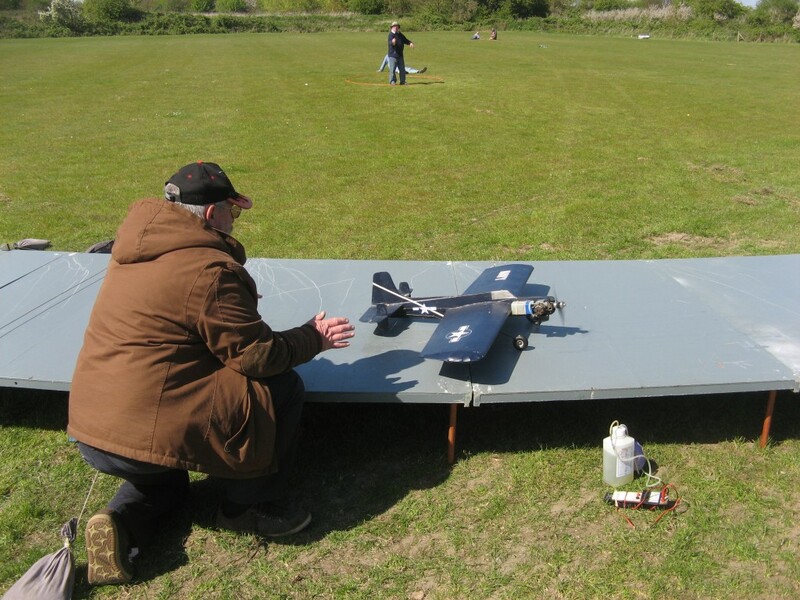 Bob Phillipps flew his SC 15 powered Short Seamew, a model now of such venerable age that rumour suggests it was recorded in the Domesday Book (in which some say that the engine noise stopped hens laying and caused premature bee swarms). Bob actually did brilliantly in last year’s Nationals, coming 3rd in BCD using his Supermarine 508 in very similar conditions to those at Damyn’s, and whilst the small Seamew has in the past achieved some very respectable scores indeed, it still seems a shame that he doesn’t exploit his potential rather more. However, for those who don’t know him, it has to be said that he has suffered both heart attacks and mini-strokes in the last few years, most of these being discovered after the event. Whilst none of these have fortunately been ‘major’ in the sense of permanent damage, some days are not so good as others. The Seamew ditched in its first flight simply due to slow engine response during the slow run, and although Bob sorted the throttle out for a much better second flight, he was high and late on landing and missed all the wires, leaving himself in 6th place with 78.6 points. Chris concentrated on using his LTV Corsair II (the Norman Ashford design) with its greater wing loading. His second flight produced his best score, 168.2 points, sufficient for a very respectable fourth place, though his last flight would have had a fractionally higher score had the model not clipped the top of the ramp on landing, turned a complete somersault and landed upside down, facing the wrong way – but still on the deck! If pilots could be given points for entertainment, Chris would have beaten everyone on not only his pilot-chamber-pot-emptying landing technique, but also on his excellently observed dress code – see the pictures! The conditions were quite suitable for Ian Gilbert’s slow flying technique and it wasn’t surprising to see him record an extremely good slow run time during his first flight, although this was rather wasted by an (unusually for him) high landing approach which missed all the wires. 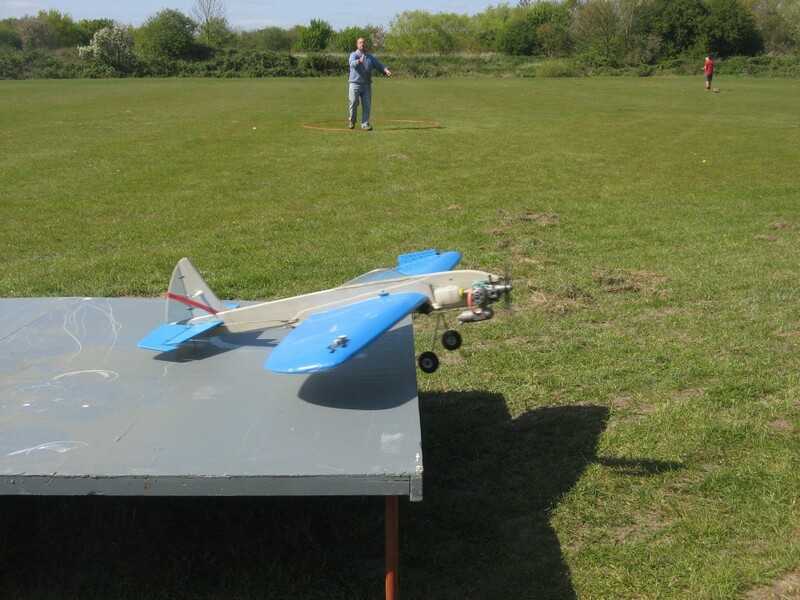 The landing of his second flight was undertaken with much greater care and resulted in his usual 100-pointer, but the problem was now the slow flight that had taken place beforehand, being about a whole minute less than the potential of the model. It was only during the third and final flight that his expected performance appeared, with easily the slowest low speed run of the entire day preceding a very careful full-score landing. Although the landing impact broke the elevator horn (fortunately, no overshoot was required…), this flight gave him a score of 251.0 points that was way ahead of anyone else and therefore put him unassailably in first place. Probably the single most common problem for Carrier models (after, of course, the classic out-of-adjustment carburettor) is silencer damage caused by landing impact. Usually this is immediately evident by the shower of bits that accompany a heavy landing (! 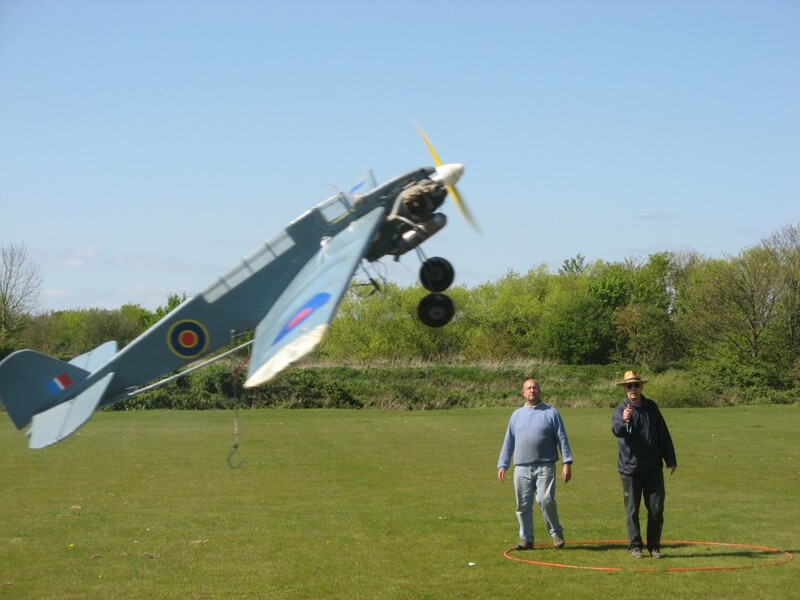 ), but sometimes the effect is more subtle and it was the latter that gave Bernard Seale a headache for most of his day and took up so much of his time that he was unable to fly his Scale Chiltern. 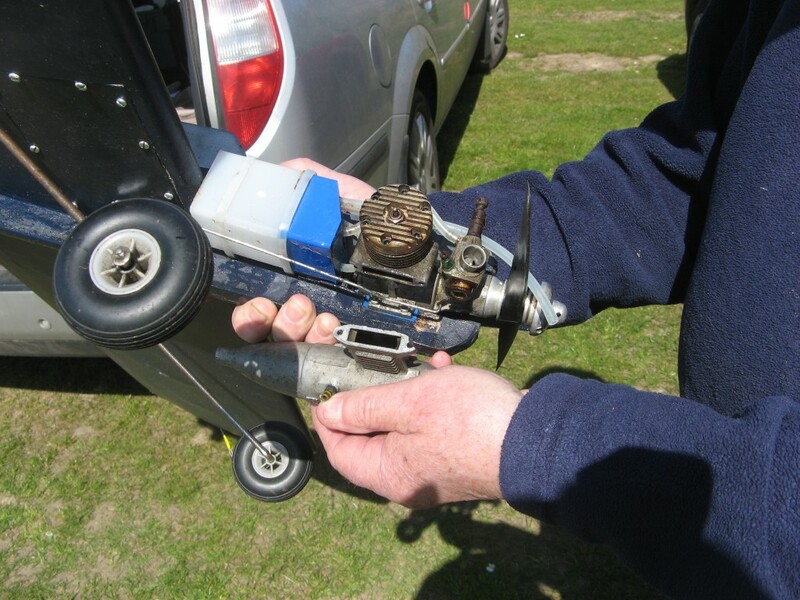 He was ready to go with his trusty SC 53-powered Grumman Guardian when the silencer’s ‘ears’ – the two ends of the flange bolted to the exhaust stack face – finally cracked right through, having obviously been fractured for a long time. With so many manufacturers making parts for each other these days, you would have thought it would have been simple to find a replacement with the same bolt spacing. Was it, buffalo! Eventually, Ray Ewart found that a dustbin silencer from one of his own models would just about fit and Bernard took to the air with this in place, completing his first flight but with a high-speed wire-skipping landing because the engine wouldn’t throttle down far enough. Different silencer, different exhaust back pressure, different throttle response? Bernard’s remaining two flights were unfortunately even less successful as the continued problems with the engine led to early ditches during the fast run, leaving him in sixth place with his initial flight score of 48.7 points. 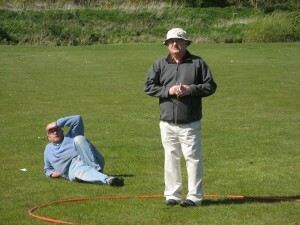 Contest Manager Peter Tribe had a number of organisational and airfield matters to deal with and had to split himself between the airfield clubhouse and the contest site. Fortunately, he had enough time not only to give his Scale clipped-wing Piper Cub an airing but also to blow the cobwebs away on his big twin electric motor Gloster Meteor III, which recorded easily the lowest times for the fast run of any model at the contest – in fact, it was frighteningly fast and clearly demonstrated how competitive electric power has now become. 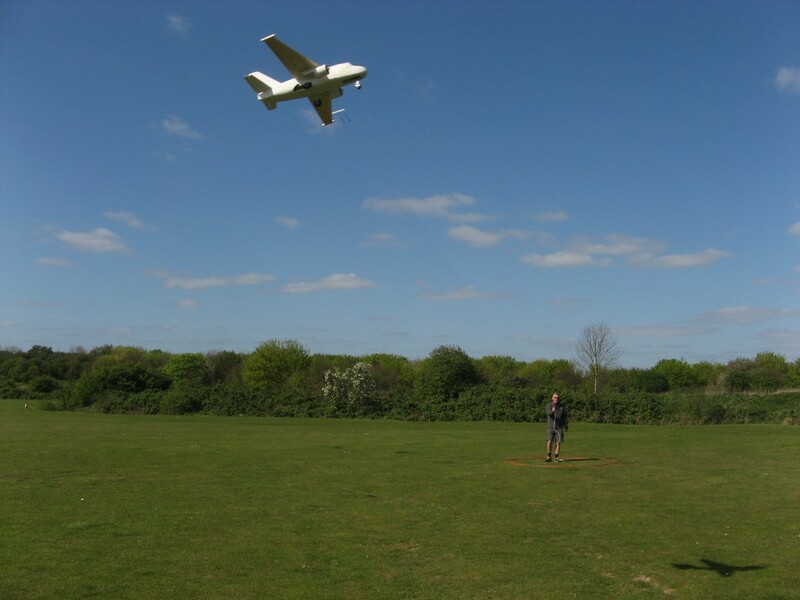 Peter, however, is a natural cautious chap and too gentlemanly to try too hard at his own competition, but even this degree of modesty couldn’t prevent the Meteor from recording the most consistent flight scores of the day. Whilst one of his landings picked up a couple of wires with his wheels instead of with the hook, the second flight produced a clean score of 215.4 points and got him third place (plus a bottle of his own wine!). 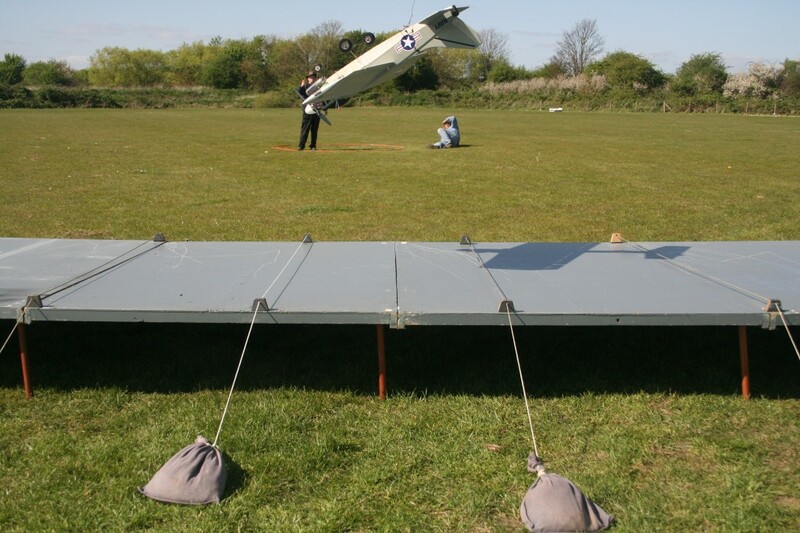 Andy Housden brought up the rear in eighth place, borrowing the ex-Noel Stephenson Douglas Skyraider from Mike Welch as his normal (and rather beaten up) Short Seamew was hors de combat. Although he produced a moderately respectable flying score on both of his flights, he failed to demonstrate sufficient skill to coax the MDS 40 through the landing approaches, dragging the tailhook through the grass for a disqualification on both occasions. 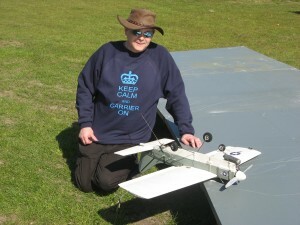 Ray Ewart, despite having spent some considerable time in the days before the contest fettling both of his Carrier models – his favourite Irvine 36-powered Grumman Bearcat built from a Brodak kit for an Aeromodeller Review in the late 90s and his reserve ST 51-powered maximum-area Fairey Firefly – found that the Irvine simply wouldn’t run consistently (and it was, of course, only after the contest that he found the problem: the tank’s clunk was lodged in the wrong position). To add injury to insult, the Firefly’s alloy tank mount also decided to disintegrate, so he borrowed the ex-Noel Stephenson Skyraider and produced rather better performances with it than did Andy Housden, managing to get down on the deck on the last two of his three flights, though the Skyraider decided on both occasions that the three-pointer required of it was both main wheels and spinner rather than tailwheel, so it failed to pick up a wire and denied Ray a decent landing score, leaving him with 101.8 points and fifth place. The Scale flying suffered somewhat from the presence of the breeze – such conditions weren’t considered particularly adverse by the Carrier flyers (the top three pilots were actually able to use it to their benefit) and also from the fact that several of the pilots found they had insufficient time to fly Scale as well as Carrier. Bernard Seale’s silencer problem has already been noted; Mike Welch had bought along his all-black Westland Lysander but spent so much of his own time getting models ready for other pilots that the Lizzie had to stay on the ground. Although Scale eventually ended up as Fly-for-Fun rather than the contest it was originally intended to be, the Tribe Brothers still put up a number of very interesting models. Peter’s Piper Cub has already been mentioned; Brother Ronnie brought along a number of his electric ducted fan designs which were extremely impressive. Ronnie, far better known within the Control Line fraternity for his Team Racing exploits in earlier years, has now gone almost completely electric, experimenting with ducted fans in particular. He has built up considerable experience with the ducts themselves and will tell you that the nature of the duct can easily make or break the model. His first EDF design a number of years ago was an He 162 Salamander, which went from a motionless (but screaming!) model to a viable flyer primarily through the changes wrought to the insides of the duct. The models he brought along today were a Messerschmitt Me 262 and a Lockheed S3 Viking, both twins. 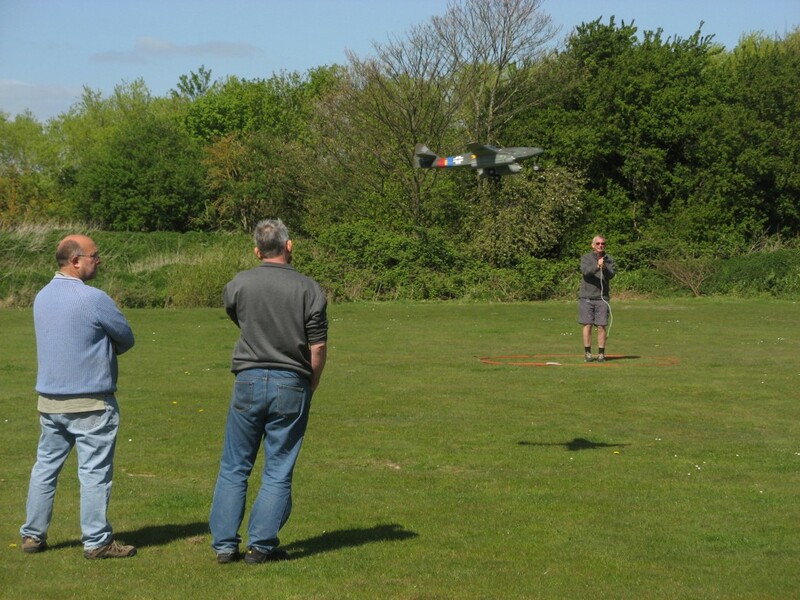 The 262 has already flown successfully in several of the past events at Damyn’s Hall and today was no different, the turbine-like whistle of the model being most realistic. Ronnie, however, was far more interested in the performance of his Viking, as the structure has only just been completed and was unflown. Although completely unpainted and with the large glazed cockpit areas covered for protection – something that’s easy to do with electric flight, of course – the model took to the air with ease on its maiden flight and coped with the hard ground by virtue of having proper scale sprung oleo-type undercarriage. Despite pleas to fit a hook to it and test it out on the deck, Ronnie put the model back under wraps after the single flight. Very sensible! 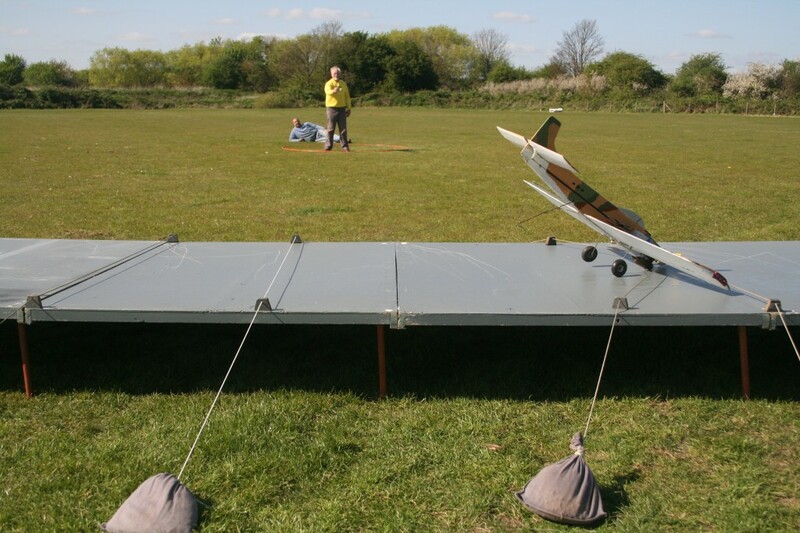 Look out for more of Ronnie’s EDF models at the various Old Warden events later in the year.